It’s been a bullish start to the day for Cardano’s ADA, with ADA up 6.89% to $0.2126 at the time of writing, with ADA well ahead of the rest of the majors through the early part of the day. Cardano’s ADA gained 5.01% on Tuesday, following Monday’s 21.8% really. A bullish trend formed from Sunday’s swing lo $0.12327 and remains intact at the time of writing. Tuesday’s intraday high $0.21141 tested the day’s first major resistance level, while support levels were left untested. Cardano’s ADA gained 5.01% on Tuesday, following Monday’s 21.8% rally, to end the day at $0.20005, easing back from an intraday high $0.21141. An intraday low $0.1747 saw Cardano’s ADA avoid testing the day’s major support level of $0.16435, while the day’s high broke through the first major resistance level of $0.20185. Falling short of the 2nd resistance level of $0.2149 ultimately led to a pullback to sub-$0.21 levels by the close, though key for the day was a hold at $0.20 levels, supporting the latest bullish trend formed on Sunday evening. While support levels were untested through the day, buyer appetite kicked in at the day’s 23.6% FIB Retracement Level of $0.1746, investors responding to relatively upbeat news from the G20 on a planned rollout of regulations that would unlikely be considered to be a major clamp down on the cryptomarket. An early intraday low $0.19687 was of little concern for Cardano investors, as gains kicked in from the start of the day, ADA steering well clear of the day’s first major support level of $0.17936, while an early break through the day’s first major resistance level of $0.21607 continued to support the bullish trend formed from Sunday’s swing lo $0.12327. It’s been a strong first half of the week for Cardano’s ADA, which enjoyed a 21.8% rally on Monday, with investors holding on, bucking the recent trend of profit taking that has limited gains across the crypto majors. For the day ahead, we will expect broader market sentiment to continue to provide direction, with Bitcoin likely to be the barometer for Cardano investors through the middle part of the day. A move back through the day’s intraday high $0.21734 would support a run at the day’s 2nd resistance level of $0.2321, though the news wires will need to be friendly through the day to avert any profit taking later in the day. 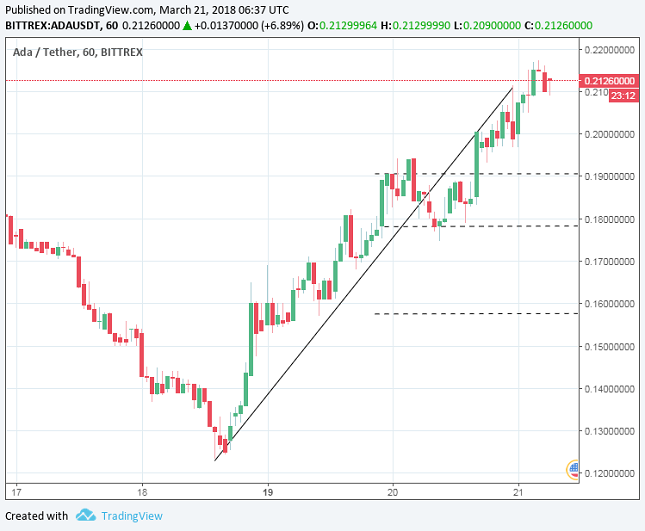 Failure to move through to $0.22 levels could see Cardano’s ADA pull back to sub-$0.20 levels and the morning’s intraday low $0.19687, which would likely test buyer appetite at today’s 23.6% FIB Retracement Level of $0.1906. Barring the release of the materially negative news, we would expect Cardano’s ADA to steer clear of the day’s first major support level of $0.17936 and, while the bullish trend will likely be intact through the day, we can expect some volatility later in the day.